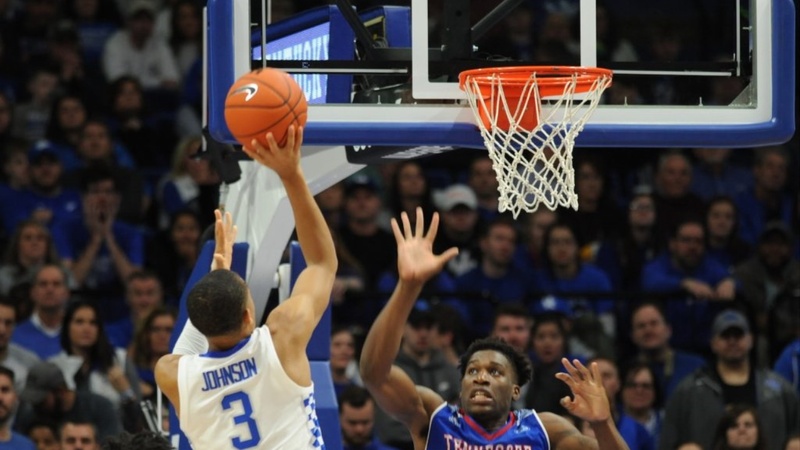 The Kentucky Wildcats hosted the Tennesse State Tigers last night and came away with a less than impressive 77-62 win. The Tigers, with a noticeable height disparity, showed a zone defense, but also played a physical game. 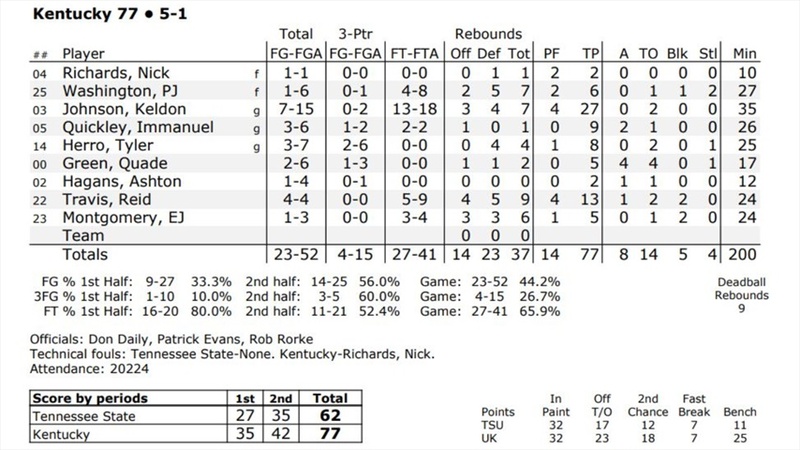 They were able to spread 29 fouls around without a player fouling out sending Kentucky to the line throughout the game. The Cats knocked down 21 of their first 25 attempts from the line and built a 20 point lead before limping to the finish line knocking down only 6 of their last 16 from the line to win by 15. Keldon Johnson was in attack mode all game and finished with a career-high 27 points while also grabbing 7 boards. Reid Travis came off the bench to go 4/4 from the field falling just short of a double-double with 13 points and a team-high 9 rebounds. The Cats held a 37-28 rebound advantage and were able to force a guard-heavy Tiger team into 19 turnovers. PJ Washington, coming off of scoring 25, 19, and 19, was held to just 1/6 from the field - 6 points. Kentucky leads the country now with 145 made free throws (74.4%). Immanuel Quickley, Quade Green, and Tyler Herro are a combined 46/50 (92%) from the free throw line. PJ Washington, Keldon Johnson, and Tyler Herro have started all 6 games. Keldon Johnson now leads UK with 16.5 points/game. UK is ranked 210th in 3 point shooting (33.0%) while being 348th in 3 point defense (43.4%). PJ Washington and Reid Travis are a combined 7/13 (53.8%) from 3. Quade Green and Tyler Herro lead Kentucky with only 2.8 assists/game. The Cats have 86 assists to 91 turnovers as a team. Yuck. Nick Richards has a 19-rebound game and only 8 more in the other 5 games combined. Ashton Hagans has 6 FGs in 6 games, averaging only 2.2 points.